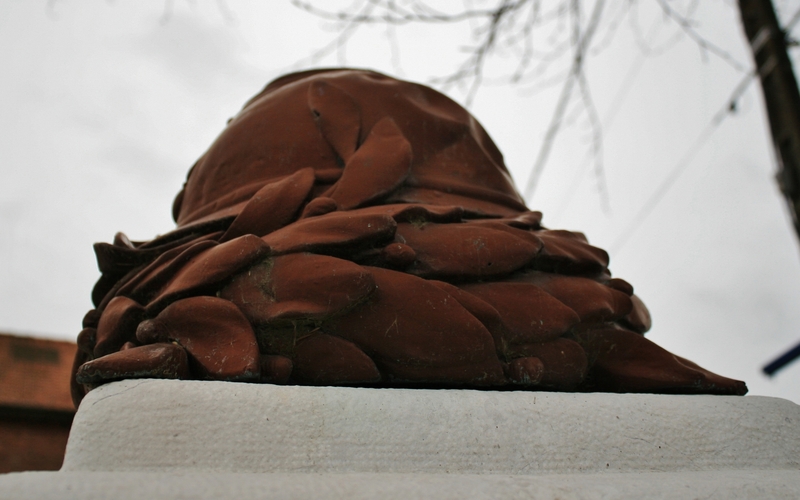 …which, as we get closer, rises above all else in this section of the churchyard. 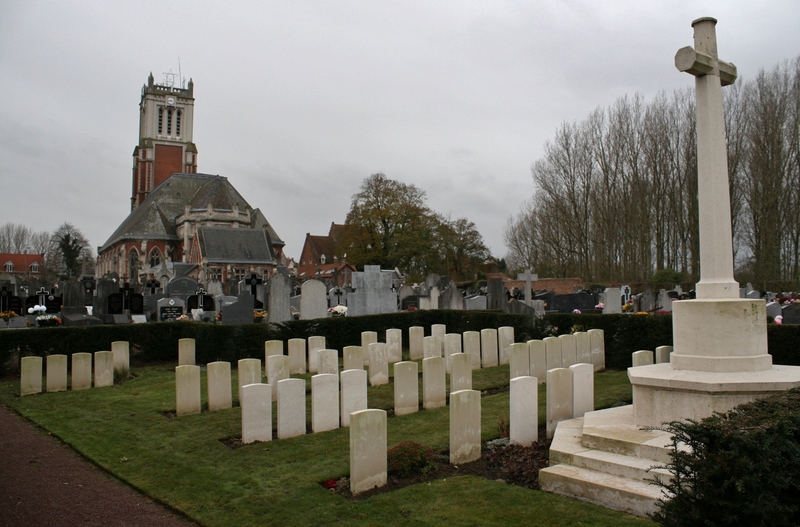 …containing just 48 Great War burials, most from the early months of the war. 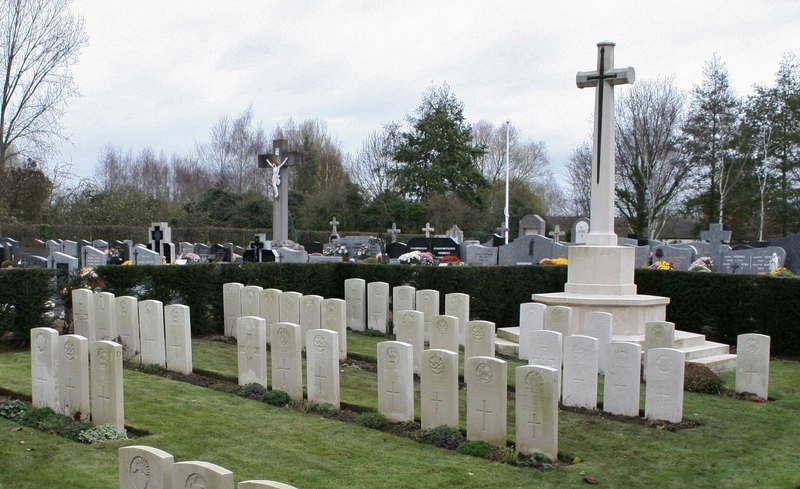 Our tour may be focusing primarily on the battles of spring 1918, but four years of trench warfare, if no major battles, had seen men dying on a daily basis all along the lines south of the Lys, and some of the cemeteries we shall visit will reflect this. 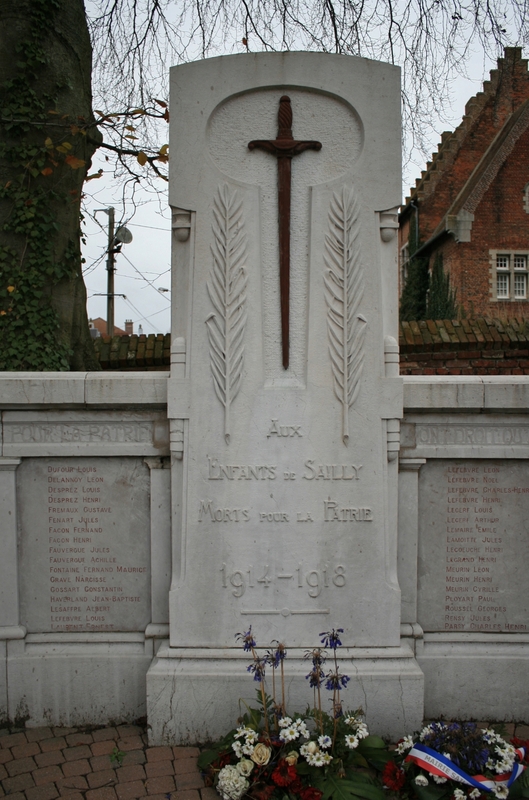 There was fighting in and around Sailly between French, British and German troops in October 1914, the church was set afire (it’s always the church – not that it was only the Germans who set churches on fire, but it does seem a slightly incongruous thing for men with ‘Gott Mitt Uns’ on their belt buckles to do), but when the front lines had settled and trench warfare took over, Sailly would find itself a couple of miles behind the British front lines, and relatively untouched, until the German Spring Offensive in 1918. The Germans would sweep across the Lys, capturing Sailly on 9th April, and holding it until September. 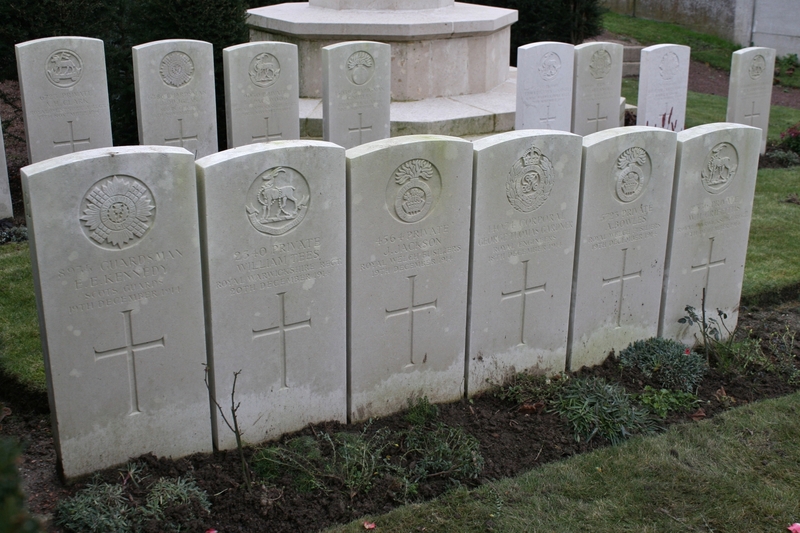 Men of the Queen’s, and a Grenadier Guardsman, in Row E, all killed in mid-February 1915. 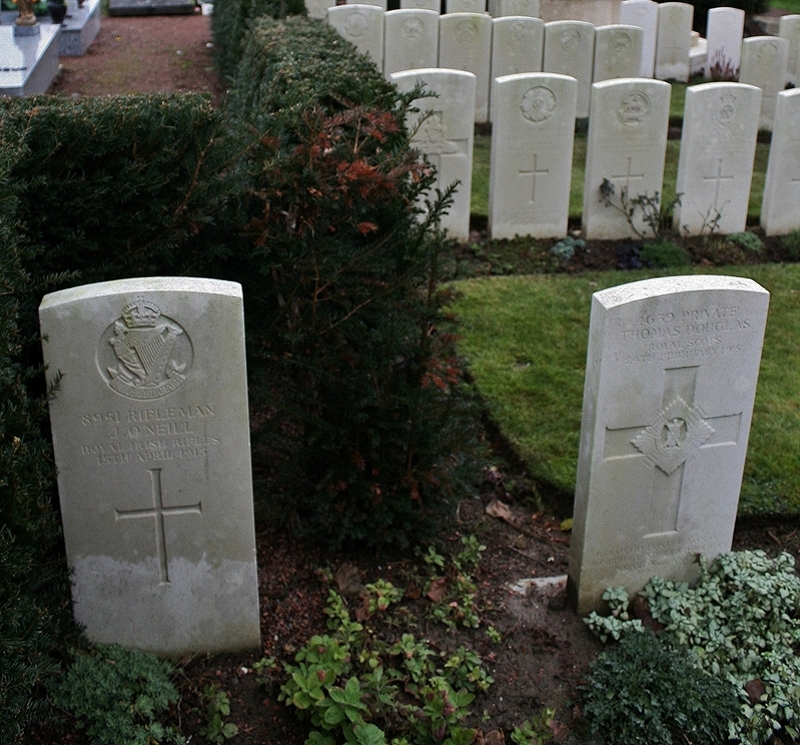 I said there are 48 Great War graves here, and indeed there are, but the grave on the right in front of the four headstones is a Second World War burial; Private Herbert John Lang, Somerset Light Infantry, aged 31, must have been killed on the retreat to the Channel coast in May 1940. 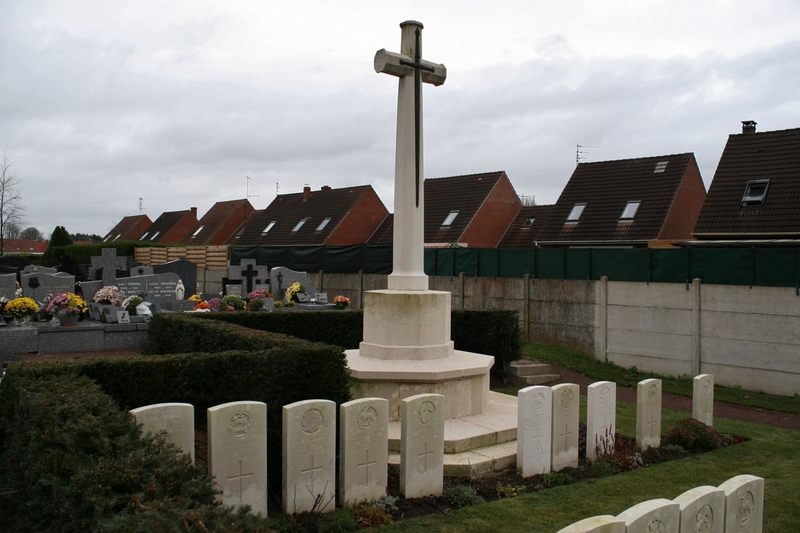 As mentioned, this little plot of graves has in general little to do with the fighting here in April 1918, nearly all the burials being men killed between November 1914 & February 1915 (three more men were buried in March & April 1915), but there are three April 1918 casualties here, and one of those, a Royal Garrison Artillery gunner, died on 9th April and is buried in Row B, the second row from the back. 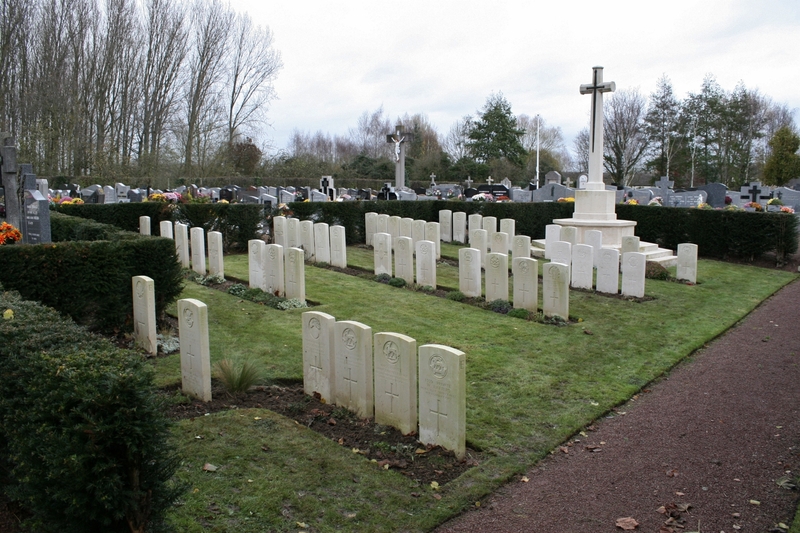 One other Queen’s man, killed in February 1917, is buried at the far end of Row D (front row). 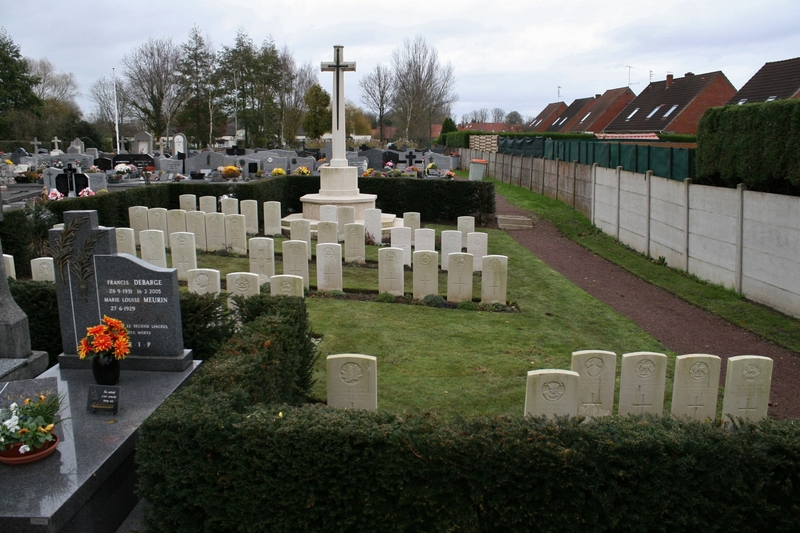 The cemetery plan, thanks to the CWGC, can be viewed by clicking the link. 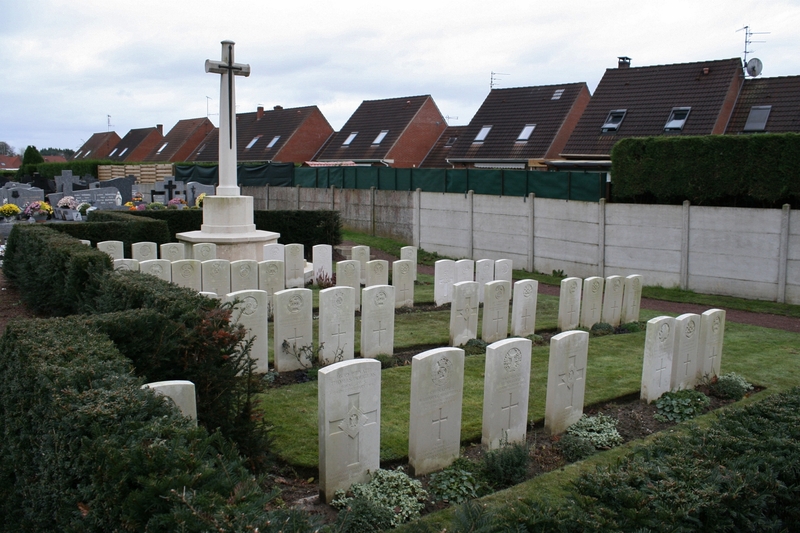 …and behind, in Row A, the earliest burials, nine of the ten men buried in this row killed in November 1914. 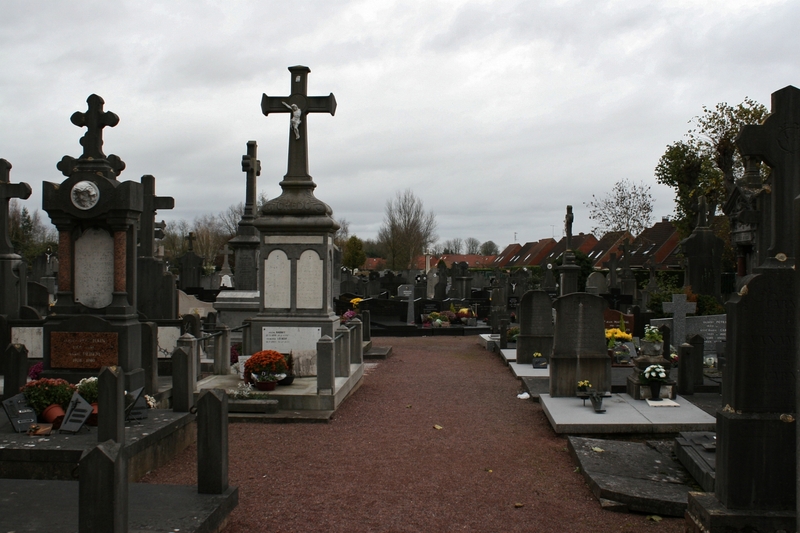 A single unidentified burial can be found among the men who lie here, at this end of Row B, the second from last row. 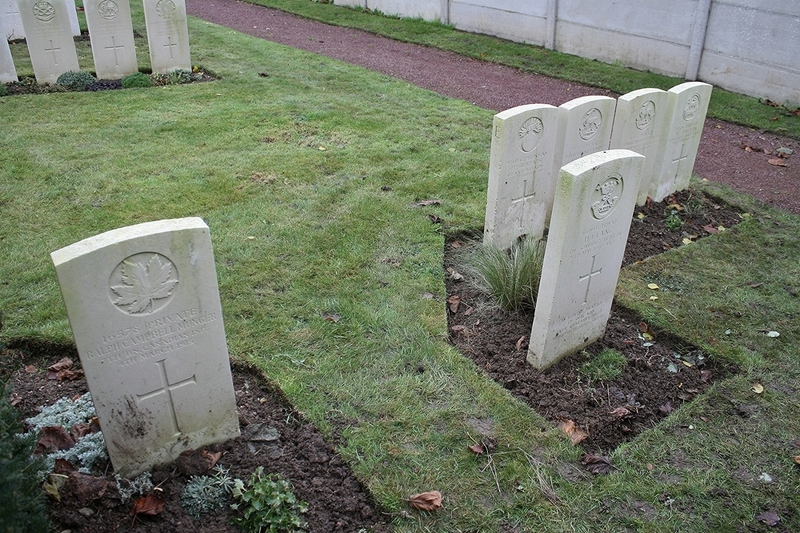 During the German tenure of Sailly in the summer of 1918 they too used the churchyard to bury their dead, which may perhaps explain the gaps between the British headstones, as the German burials were removed after the war and reinterred in Sailly German Cemetery, where we visited last post. 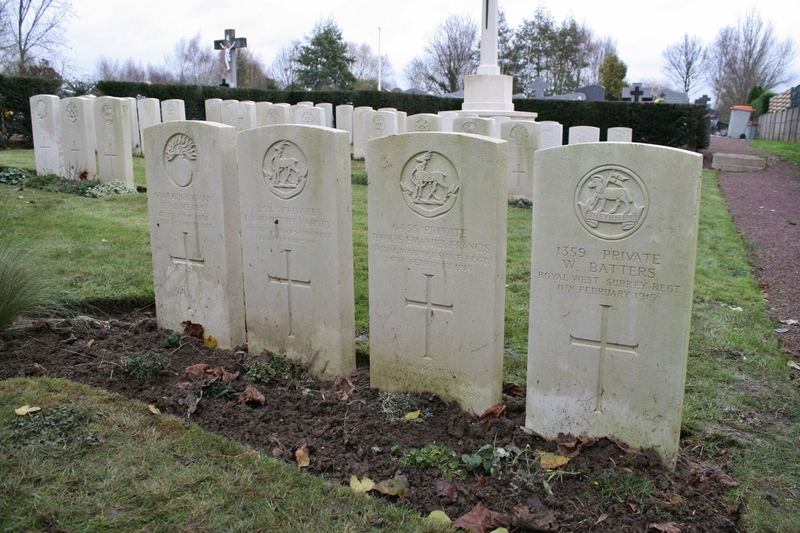 Three British prisoners-of-war who died of their wounds in German captivity were also buried here, but the exact location of their graves has long been lost. He’s skulking. I think that’s the word. Yep, skulking. 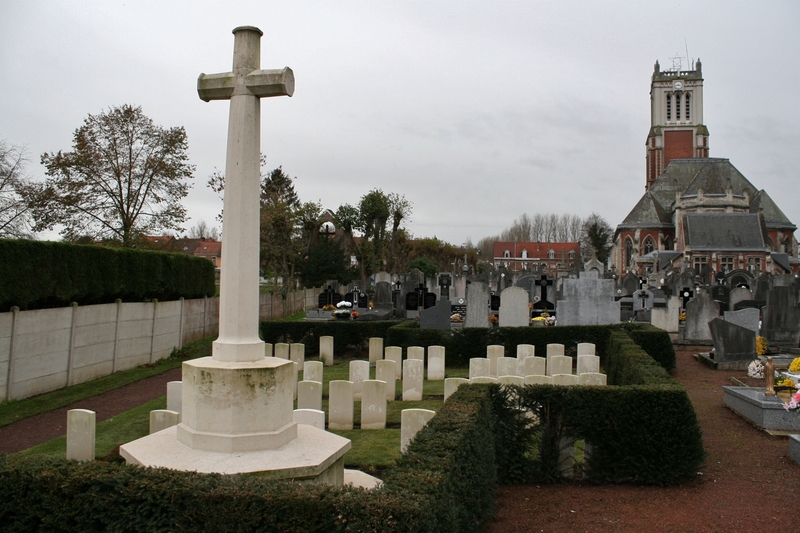 Despite the damage to the church during the early skirmishes of October 1914, it was not until 1918 that the village saw the full fury of war directed against it. 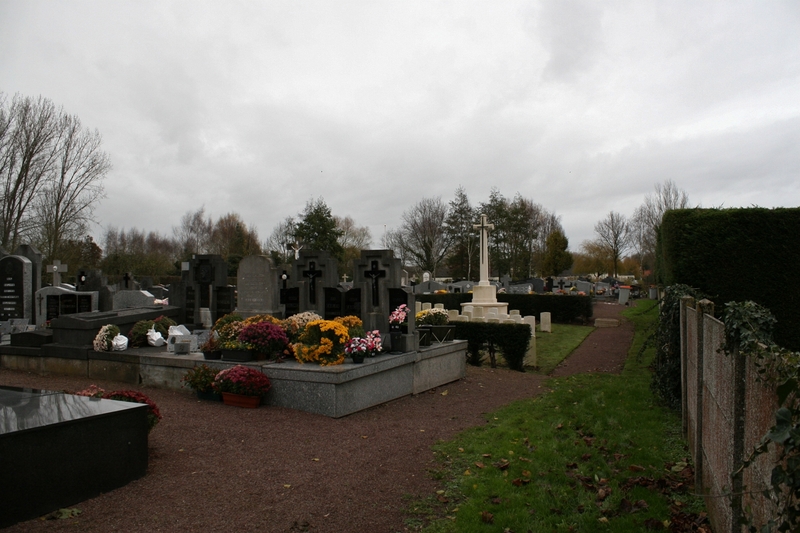 Like the other towns and villages along this section of the Lys, Sailly would be devastated by first German, and then, throughout the summer of 1918, Allied, artillery. 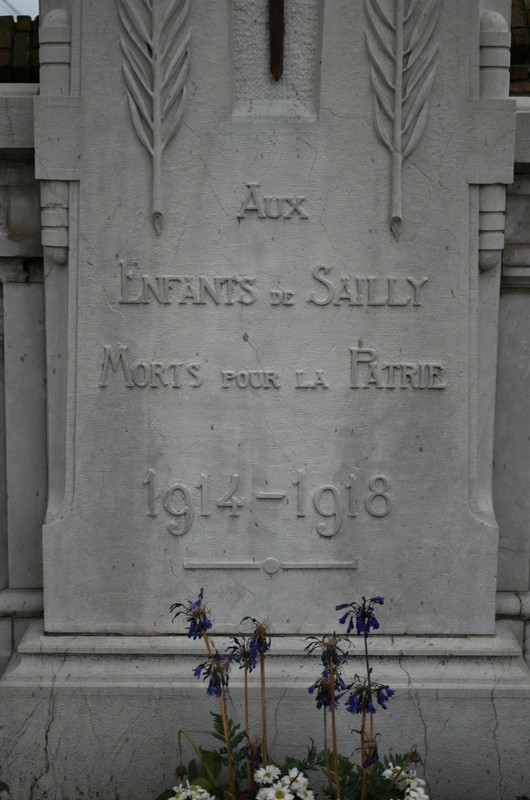 …and remembering the ‘children of Sailly who died for their homeland’. 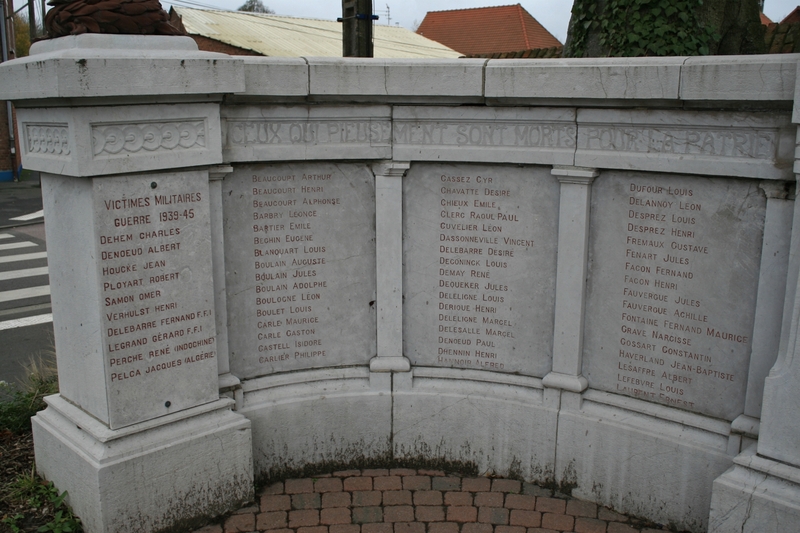 Three panels on this side of the central obelisk are inscribed with the names of the town’s Great War military dead, with the final panel on the left remembering the Second World War military casualties, and a few from the post-war years. 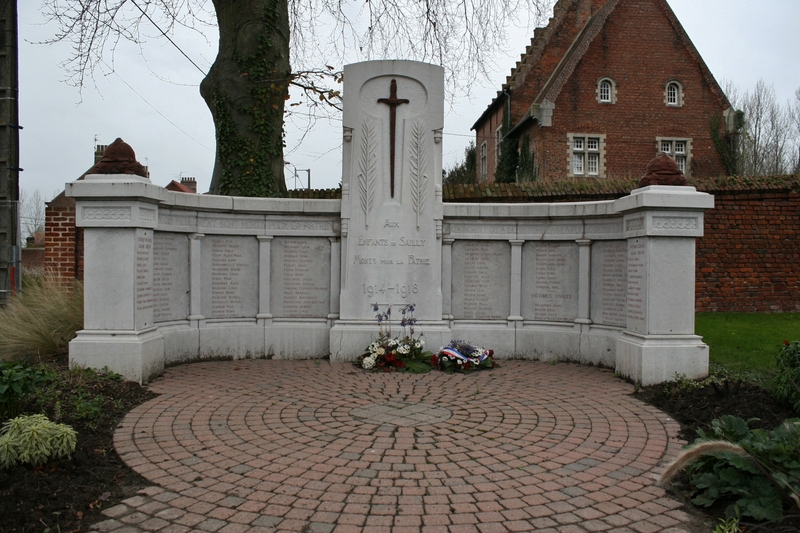 I happen to know that Sergeant Jacques Pierre Arthur Peluca, 11th Shock Parachute Regiment, aged 24, the final name on the far left panel, died in a military hospital in Maillot, Algeria, on 13th March 1961, from injuries received in an accident. 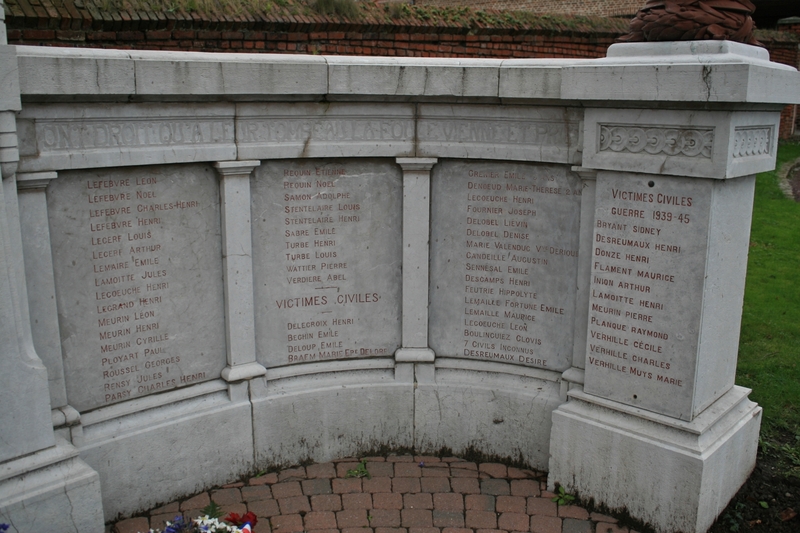 On this side there are three more panels of Great War casualties, nearly half of them civilian, and then a panel of Second World War civilian dead at the end. 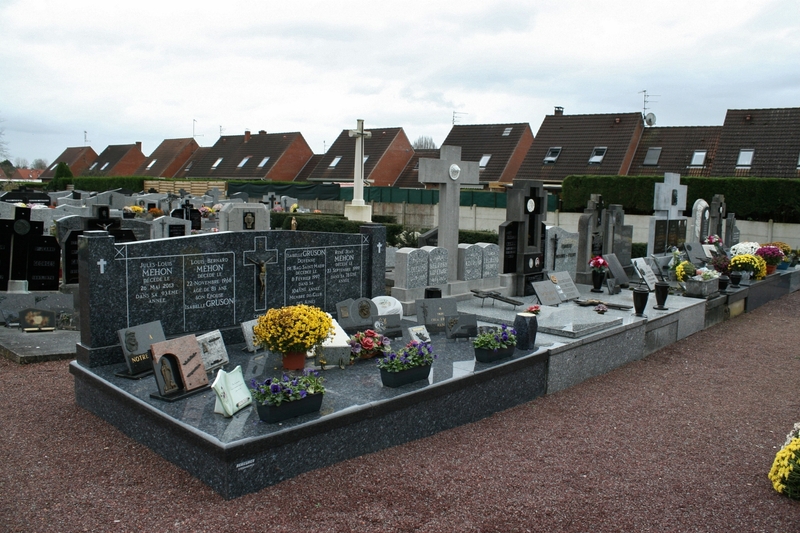 Sixteen year old Henri Désiré Aimable Joseph Desreumaux was killed during an air raid on 27th May 1940, and little Pierre Lucien Joseph Meurin, just four years old, died in the basement of his parents’ home during a raid on 8th August 194o. 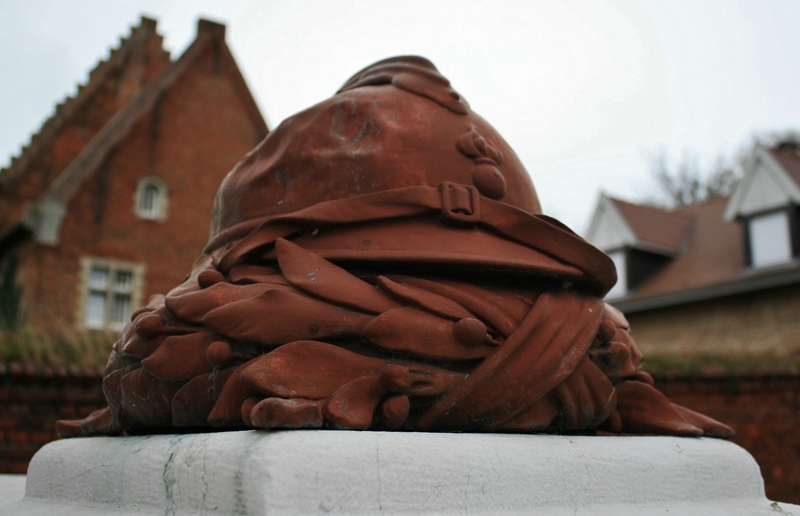 British or German bombs? I think we know. 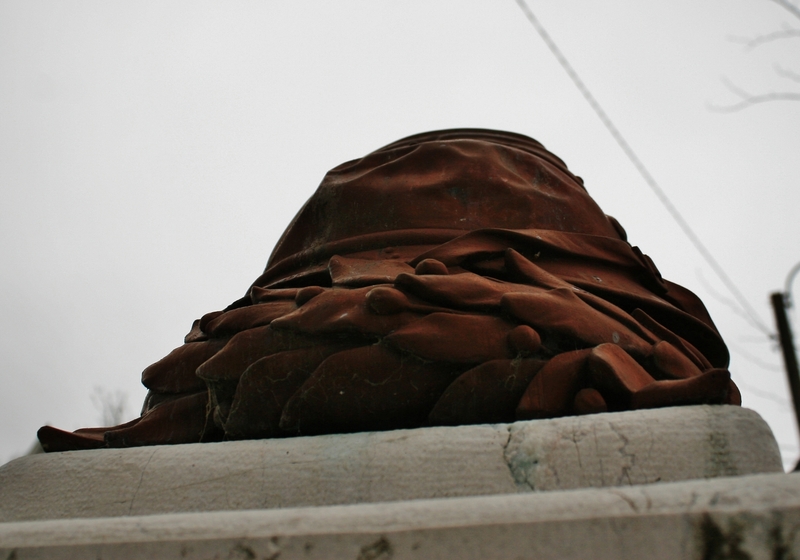 …although whether intentionally battered, or vandalized, I really don’t know. 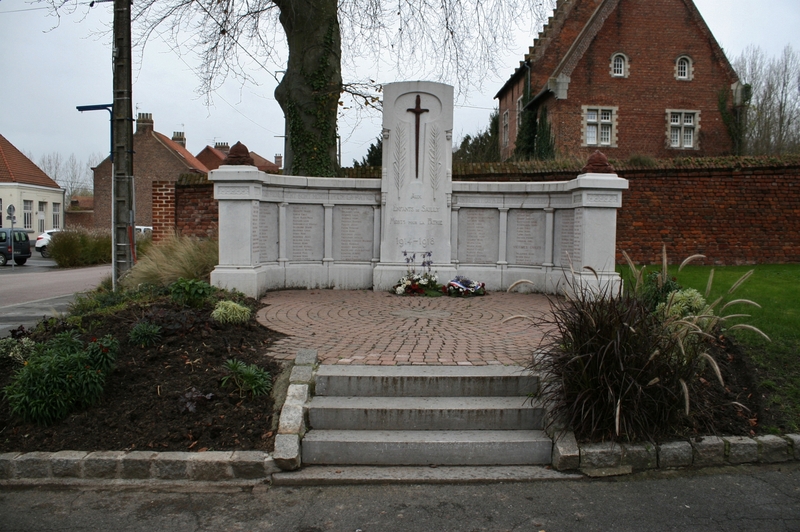 Opposite the war memorial, another monument to local men of honour. 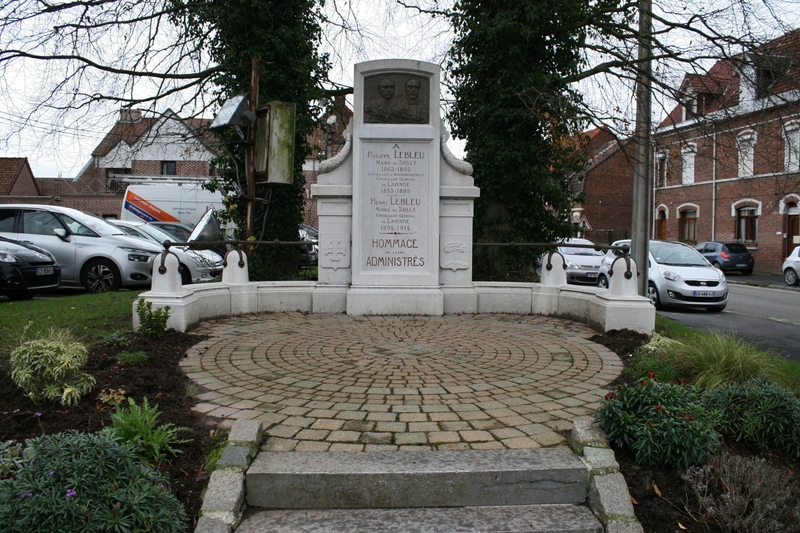 The municipality of Sailly-sur-la-Lys, in a grandiose patriotic demonstration, has honorably honoured, on Sunday 6th July 1924, the memory of eighty of its children who died on the field of honour, and civilian casualties who died during the occupation. The program of the festival included the presentation of the flags of the local companies, the mass in commemoration of the dead of the war and the inauguration of the monument to the children of Sailly, dead for the fatherland, which took place under the presidency of Mr. Stirn, sub-prefect of Bethune, under the honorary presidency of General Gascouin, commander of the artillery of the 1st Corps, accompanied by political figures of the region, Mr. Couhé, deputy general counselor of the canton of Laventie, and M. Duquesne, Mayor of Laventie and general counselor. Sailly-sur-la-Lys, partly cleared of its ruins, had put on its finery. All the houses, decorated as much by taste as emulation, offered a magnificent setting for this unanimous demonstration of sympathy for war-torn families and for the recognition of heroes fallen on the field of honour. In all the streets artificial doors of foliage and flowers were raised and two magnificent triumphal arches, perfect of taste and originality, due to the generosity of local entrepreneurs MM. Debruille and Menard, were erected on the main street leading to the monument. In the presence of the municipal council, meeting at the town hall, Mr. Couhé, deputy general councilor, proceeded with the presentation of the flags to the society of the veterans and disabled and to the reconstituted company of the firemen, and pronounced a patriotic speech. 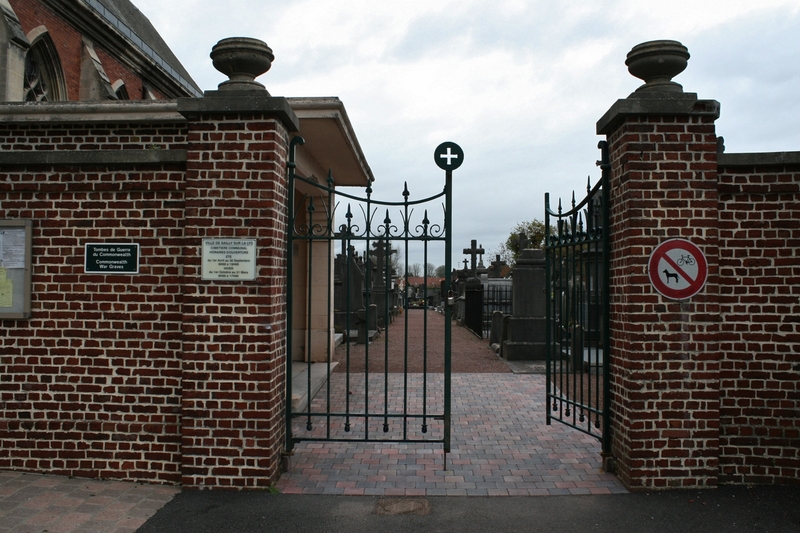 At ten o’clock, the solemn mass was sung by Father Ployart, a native of Sailly-sur-la-Lys, former captain in the war, Knight of the Legion of Honour, Croix-de-Guerre. The Mayor of Sailly, surrounded by his municipal council and his deputy Mr. Couhé, and the delegations of all the companies, attended the ceremony. Canon Regent, military chaplain, Officer of the Legion of Honour, in a sermon which made a deep impression, masterfully expanded upon the immortality of the soul. Then came the recommendation of the dead. The communal music, directed by its excellent conductor, Mr. Broucke, was heard during the ceremony. 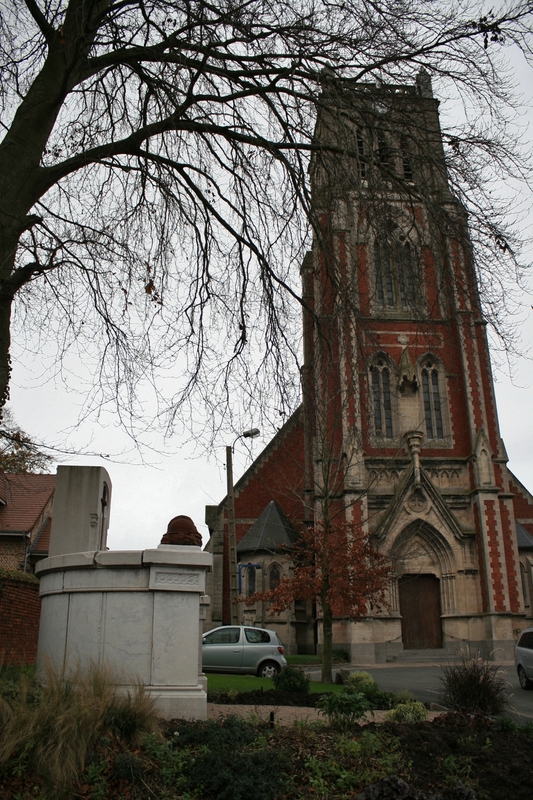 At the end of Mass, the parish priest of Sailly proceeded to the solemn blessing of the monument erected at the entrance of the church and the canon Regent pronounced a vibrant address. The religious ceremonies were over. At one o’clock, in the hall of the ‘At the Cross’ inn in Sailly, more than two hundred guests gathered for a banquet. At the table of honour, Monsieur Coute, deputy general councilor, took his place with M. Boutte, mayor of Sailly; Mr. Duquesne, Mayor of Laventie, borough councilor; the canon Regent; Mr. Couhé-Lebleu, Honorary President of the Court of Lille; Mr. Charles Lebleu, Counselor at the Court of Douai; Messrs. the mayors and deputies of the neighboring communes, Lestrem, Fleurbaix, Lorgies, Laventie, Neuve-Chapelle, the municipal council of Sailly-sur-la-Lys, the presidents of the participating companies; Messrs. local architects and contractors; Messrs. the justices of the peace of the canton of Laventie. At the end of the meal, during which cordiality never ceased to reign, Mr. Stirn, sub-prefect of Bethune, and General Gascouin, detained until then by other ceremonies, were welcomed with respectful sympathy. The Mayor of Sailly, opening the series of toasts, thanked the personalities present at the party in delicate and happy terms and raised the unanimous applause of the audience by greeting Mr. Couhé, Member of Parliament for the Pas-de-Calais, child of Sailly-sur-la-Lys, whose young glory springs upon the whole commune. M. Couhé, in a brilliant and spiritual improvisation, responded to the Mayor, thanked the organizers of the feast and banquet, and, painting a masterful picture of the current situation, drew the necessary conclusions that the sacrifice of our heroes was not useless. Mr. Stirn, sub-prefect of Bethune, who himself did not make a speech, but who knows how, in a few words, to say many kind things for all, finished by toasting the health of Mr. Doumergue, President of the Republic. 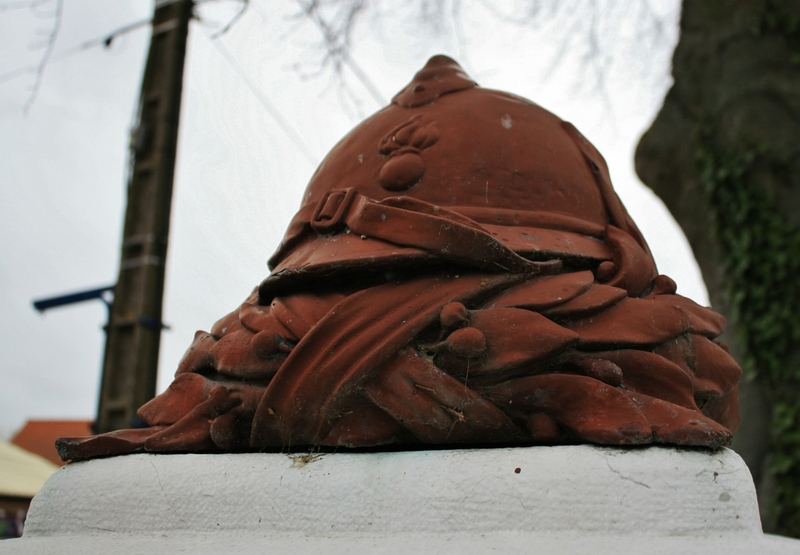 After reviewing the companies taking part in the festival, local music companies, firefighters, veterans, and neighboring companies of Fleurbaix, Laventie, Estaires, Le Doulieu, Neuve-Chapelle, Stenwerck, the official procession went to the monument and took its place on a platform. The monument, the inspiration of Mr. Monoyer (sic), architect of the reconstitution of Sailly, is quite remarkable. It consists of a stela, bearing a sword turned towards the ground and a semicircle on which are engraved the names of the victims of the war with in exergy the classical verses: Those who have piously died, etc. 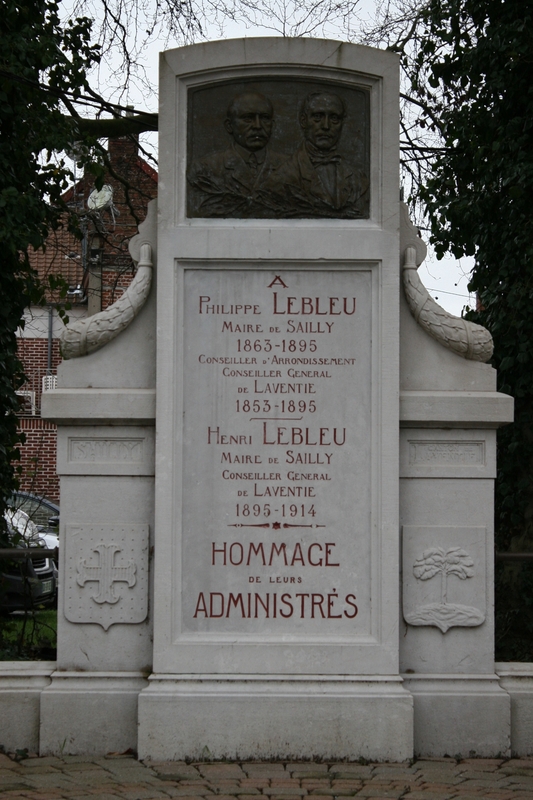 Mr. Ménard, president of the erection committee, presented the monument to the municipal administration. Mr. Boutte, Mayor, thanked the committee and delivered a very much appreciated patriotic speech. Mr. Delettrez, veteran, made the call of the dead. 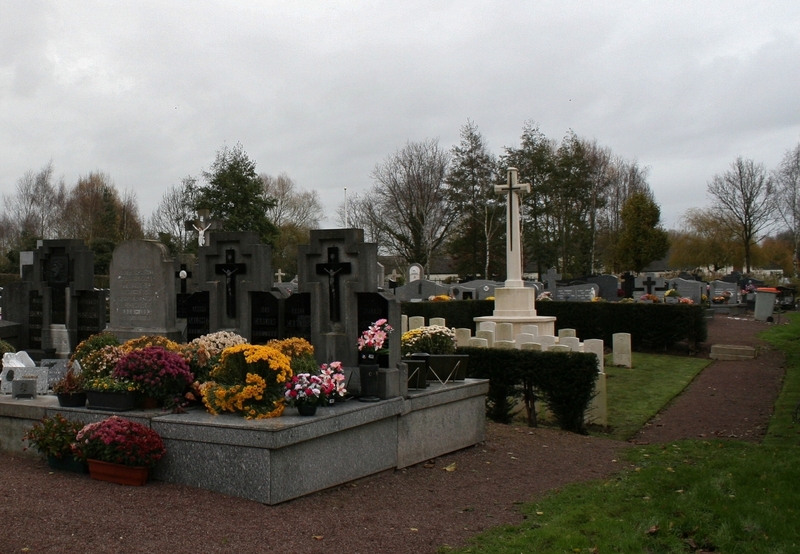 M. Couhé, deputy, praised the memory of heroes fallen in the field of honour, drawing the great lessons which emerge from their sacrifice, freely consented and associated with their glory, the memory of M. Henri Lebleu, mayor of Sailly during the occupation, and of Father Allart, priest of Sailly in 1914, whose heroic conduct was a powerful comfort for the population. General Gascouin, recalling the aggression of Germany, and the duration of the war, due to our lack of preparation, payed tribute to the dead, a tribute he wanted more heroic than tearful, and urged assistance to understand the need for serious preparation to avoid the return of the horrors of modern warfare. 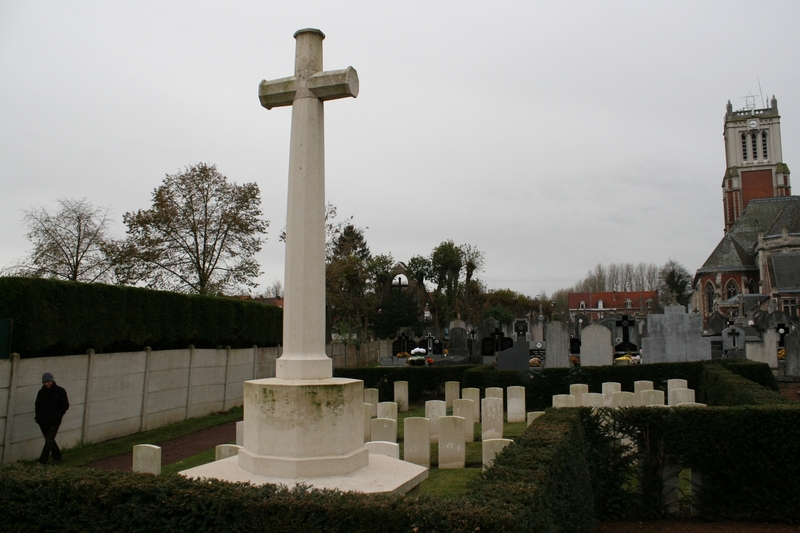 Mr. Stirn, sub-prefect of Bethune, joined the previous speakers, to pay tribute to the dead, recalling the work accomplished since the armistice, and in an eloquent evocation of the Republican soldier, glorified those who have fallen so that France and the Republic may live. 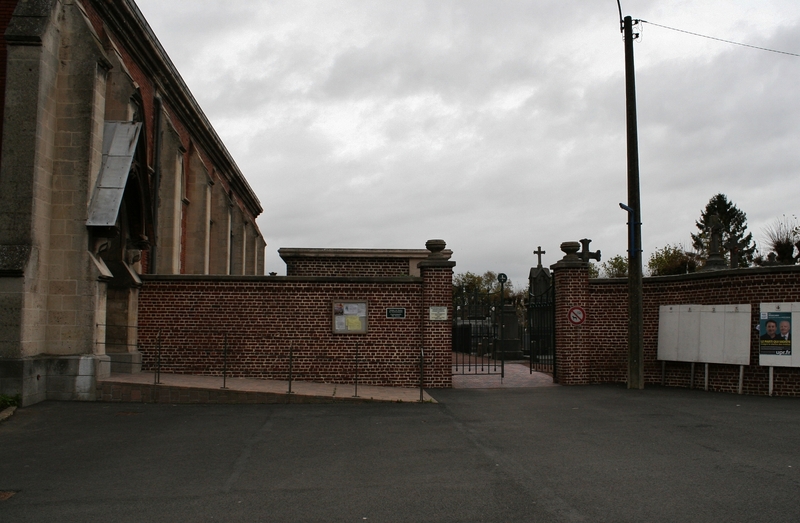 The municipal musicians and a group of young people of the commune played Victor Hugo’s Hymne aux Morts (hymn to the dead), religiously listened to by the audience. This beautiful and unforgettable event ended with a highly applauded performance of concerts, given by the participating musicians, on various kiosks erected at several points in the locality.